President Donald Trump addressed the nation Tuesday night in his first prime-time speech from the Oval Office. He urged Congress to approve $5.7 billion to build a wall on the U.S.-Mexico border, but he opted not to declare a national emergency to force construction of the wall, in a xenophobic speech riddled with falsehoods. President Donald Trump addressed the nation Tuesday night in his first prime-time speech from the Oval Office. He urged Congress to approve $5.7 billion to build a wall on the U.S.-Mexico border, but he opted not to declare a national emergency to force construction of the wall, in a xenophobic speech riddled with falsehoods. Oscar Chacón is the executive director of Alianza Americas, an immigrant rights group based in Chicago. After Donald Trump addressed the nation Tuesday in a speech that attacked immigrants and demanded a border wall, Sen. Bernie Sanders called out the president for lying to the American people and creating a false crisis at the border. 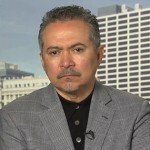 Oscar Chacón is the executive director of Alianza Americas, an immigrant rights group based in Chicago.